My play on boiled eggs and toast soldiers! My play on boiled eggs and toast soldiers is a sweet combo of boiled vanilla custard and mango puree poured into sterilized eggshells. Like the original savory toast version, the shortbread soldiers are used for dipping into the faux yolk. Morning coffee has been made extra sweet in the form of a lollipop. It can be enjoyed as is or you can use it in a brewed cup to stir in strength and sweetness. Posted by Sterling Publishing • Published 9th May 2012 • See Sterling Publishing's 10 projects » © 2019 Heather Baird / Sterling · Reproduced with permission. Preheat the oven to 200°F. Place a cooling rack over a baking tray. Crack the eggs by tapping them with a spoon on the most pointed end. once the egg tip is cracked, pinch away just enough of the eggshell top for the egg white and yolk to pour out. Reserve 2 whole eggs for the custard and save the rest for another use. Wash the shells in warm water. Rub your finger on the inside to remove any bits of the membrane. Place the cleaned eggshells upside-down on the cooling rack and bake for 20 to 25 minutes. Let the sterilized eggshells cool com- pletely before you fill them with the custard. note: Prepare the eggshells by standing them upright in an egg carton. In a small saucepan, whisk together the milk and sugar and place over medium heat. Heat until the milk is very hot but not boil- ing. Remove from the heat. Add confectioners’ sugar and beat until incorporated. Add vanilla extract and mix again. Add 1 cup of the flour and the salt, and mix on low speed until a dough forms. Add the remaining 1 cup of flour and mix again on low until a very stiff dough forms. Gather the dough together with your hands and place it on a lightly floured surface. Using a floured rolling pin, roll the dough until flat- tened to about a 1-inch thickness. Wrap the dough in plastic film and place on a cookie sheet or jelly roll pan. Refrigerate for 30 min- utes. This dough will firm up quickly because of the high butter content. If your dough is dif- ficult to roll, let it stand at room temperature for a few minutes until it is pliable. While the dough is still cold, on a floured surface, roll it out to a N-inch thickness and transfer to the prepared baking sheet. Score with the tines of a fork. You can cut the dough into shapes with a cookie cutter, or bake the entire piece and cut them into “soldiers” after baking, while still hot. When done, the shortbread will be golden brown around the edges and fragrant. Grease 2 metal baking sheets with the shortening. Stagger the lollipop sticks on the sheets to give the candy plenty of room to spread when you pour the hot mixture. In a medium saucepan, combine the sugar, espresso, corn syrup, cocoa, and cinnamon. Clip a candy thermometer to the side of the saucepan and place over medium heat, stirring until the sugar has dissolved. Simmer until the mixture reaches 290°F. in the vanilla. The mixture may sputter and bubble a little. Using a metal (or heatproof) 1 tablespoon measure, dip the candy by the heap- ing tablespoon and pour over the end of the lollipop sticks. Let cool at room temperature until hardened. To remove the lollipops from the baking sheet, gently push the candy with your fingers or a spoon to slide the candy off the edge of the baking sheet. Do not try to lift it or the lollipops may crack. Wrap the lollipops in cellophane candy wrappers or store in an airtight container. They will stay fresh for 1 month. Mix K to 1 teaspoon of espresso powder into the L cup hot coffee before adding it to the saucepan. I loved this highly caffeinated super- strength treat! Serve the custard eggs in a decorative egg crate, or pile sugar on a plate to hold the eggs upright. 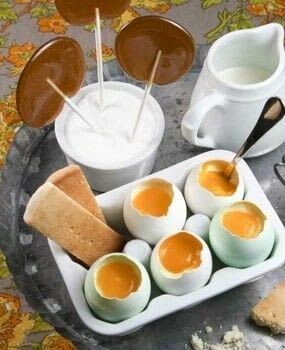 Serve with shortbread soldiers for dipping and the coffee lolli- pops on the side.